GB HealthWatch, a San Diego-based digital health and nutritional genomics company, has launched a mobile app-powered research engine, the HealthWatch 360 Research Portal, for collecting diet, nutrition and health data. Designed by scientists, the platform allows for easy enrollment of large study cohorts while providing accurate and reliable dietary intake and nutritional data. On the wings of President Barack Obama’s announcement of the Precision Medicine Initiative and as we enter the era of precision health, we will increasingly use genetic information to identify health risks and develop preventive strategies to avoid disease. Diet and lifestyle changes are at the heart of these strategies for the prevention of today’s major chronic diseases: heart disease, type 2 diabetes and obesity. Mobile and social networks are enabling unprecedented levels of self-monitoring and data sharing, potentiating the availability of massive data to help us understand gene–diet–disease interactions. From this we can formulate gene-targeted personalized dietary and nutritional interventions. Simple to enroll participants. Invite by email, batch upload or enroll one-by-one. Easy management. Review food and nutrition reports of individual participants in real-time. Send direct messages. Comprehensive analysis of 50+ nutrients in the diet. Download reports in excel format at any time point. Collect mobile app-powered 24-hr dietary recalls. Drawing from a database of over 500,000 brand name items, restaurant foods, vitamins and supplements, the HealthWatch 360 Research Portal provides data for over 50 nutrients in the diet. There is no other platform that provides this much nutrition detail. Researchers can export this data in excel format and correlate nutritional intakes with other health parameters to better understand the role of diet and nutrition in disease prevention. Nutrition is a vital component of precision health and preventive medicine. Data collected via the HealthWatch 360 Research Portal will allow for gene-nutrition-health interactions to be quickly validated and treatments, especially dietary interventions, to be experimented with and refined. Given the epidemic of diet-induced chronic diseases in the United States and worldwide, it is imperative that we focus our efforts on preventive strategies that house diet and nutrition at their core in order to improve the health of our future. GB HealthWatch is a digital health and nutritional genomics company. We study gene-diet-disease interactions. Our mission is to help prevent common chronic diseases through targeted, gene-based nutritional and dietary intervention. We aim to inform people about the scientific basis of chronic diseases, support them with nutrition management products and services and empower them to take control and live better lives. 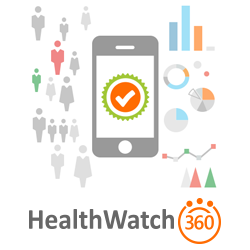 GB HealthWatch offers the following portals: the HealthWatch 360 mobile app for individuals to monitor and improve their diet quality and nutrition; HealthWatch 360 Wellness for organizations; HealthWatch 360 Research Portal for academics and research institutes to study diet and health interactions.